Making electronics portable can come with some heavy sacrifices. You can make a phone the size of a credit card, but people choose larger phones because they can do more. This is particularly true with projectors. It’s not that tough to make a projector which can fit in your hand. But making that projector look great can be challenging. It’s worth keeping in mind that portable can mean many things. 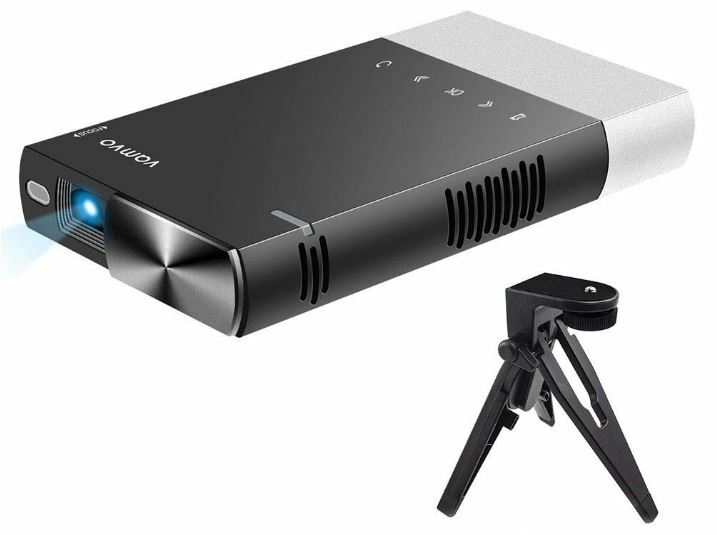 Even the most stationary projectors on the market are still small enough to pick up and move. Many of them are about as portable as a laptop. But how many have the portability of a smartphone? Notice the Vamvo S1 Ultra Mini Portable Projector makes sure to specify, instead of merely being portable, it’s ultra-portable. It’s intended to be small enough to be stuffed into your pocket, not unlike a phone. That leaves us to ask only one question, what kind of power does it have? Though the S1 isn’t about to defy the laws of physics, it does manage to pack enough of a punch to create an impressively bright and clear display. In many ways, it’s basically like having a smart TV you can throw into a small bag. And that makes it somewhat ideal for classrooms, business meetings, small gatherings, and similar circumstances. The S1 measures 5.7 x 3.2 x 0.9-inches. Though it’s a tad thicker than most smartphones, it uses a similar rectangular build. And that build allows the Vamvo S1 to be about as portable as a phone. The topside has a small LED which can indicate the status of the battery. It also has a variety of touch-keys that can be used for operation. The touch-key design helps ensure the projector won’t have control issues when you stick it in your pocket. And the controls themselves are fairly intuitive. You can figure out most at a glance, like the left-and-right arrow icons, the “OK” button, and so forth. After you’ve become accustomed to the layout, it does allow you to quickly and efficiently operate the S1. With portability in mind, the Vamvo S1 uses a sliding lens cover. It can be secured across the front lens with gentle pressure. Sliding lens covers are always a favorite because there’s no chance for you to lose the cover. On the left side of the Vamvo S1 Ultra Mini Portable Projector, you’ll find a small focus wheel, which resembles a volume scroll wheel. Beneath that wheel, you’ll find a HDMI port, SD card port, 3.5mm audio hack, Lightning connection, USB-C port, and a DC power plug. The inclusion of a data-friendly USB port means the S1 can also support Fire TV Stick, ROKU Streaming Stick, Chromecast, and so forth. 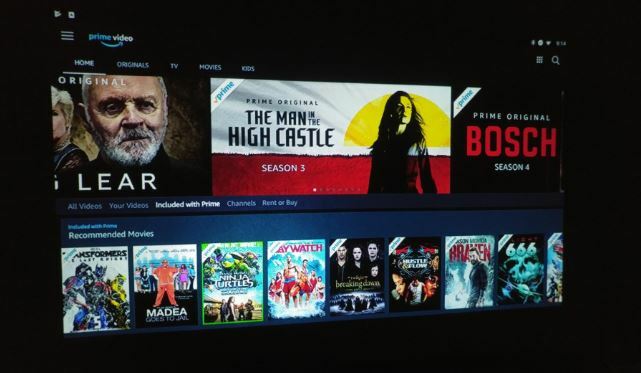 Basically, the sky is the limit for streaming services. 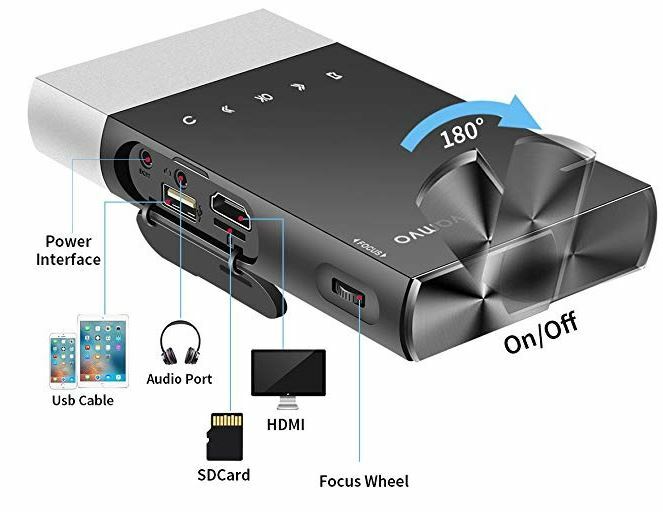 These ports also ensure the Vamvo S1 Ultra Mini Portable Projector is compatible with the iPhone, iPad, Android devices, desktop PCs, game consoles, and so on. In addition to analogue connections, one of its core connection features is digital. 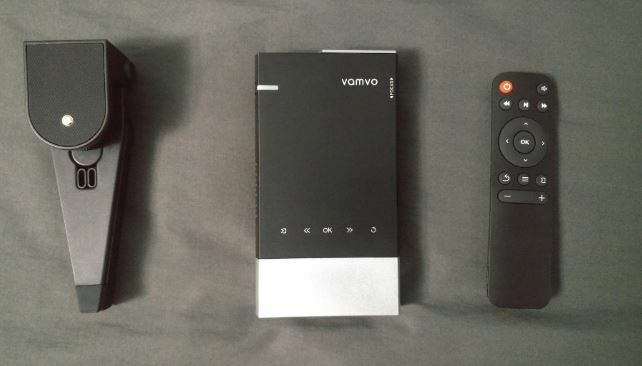 The Vamvo S1 supports DLNA, AirPlay, and Miracast. With the help of any of the three, you can project content from any of your connected devices straight onto the projector. The Vamvo S1 Ultra Mini Portable Projector is powered with a 5200mAh lithium-ion battery. Relative to the size of this projector, that’s a fairly large battery. It’s comparable to the kind of thing you’d find stuffed inside a gaming laptop, and it allows for about two-hours of playtime before you need to think about recharging. Covering the length of most films, that lifespan is pretty compelling, even compared to much larger portable projectors. Plenty of full-sized portable projectors tap-out around the 90-minute mark. Of course, battery outcomes depend on a variety of factors. The most important factor is usually brightness. If you’re willing or able to reduce the brightness from its native 1800 lumen maximum towards the lower limits, then you could plausibly squeeze another 30-minutes of battery life out of this projector. The Vamvo Ultra Mini Portable Projector is capable of a fairly wide range of visual projection tasks. Matching its native resolution, the minimum projection size is 15”, which makes the display comparable to a smaller PC monitor. Screen size can be stretched to 130”, making it about the same as many of the largest TVs on the market. That’s also about half-as-large as a full-sized projector in the same price range. Native resolution for the S1 is 800 x 480 using 16:10 aspect ratio. About two decades ago, that would’ve been considered a standard resolution. These days, that’s a tad low compared to high definition content. But it’s every bit as clear as analogue television. For a home theater projector, you’d probably want to move towards 720p. But the Vamvo S1 Ultra Mini Portable Projector isn’t trying to replace a home theater projector. 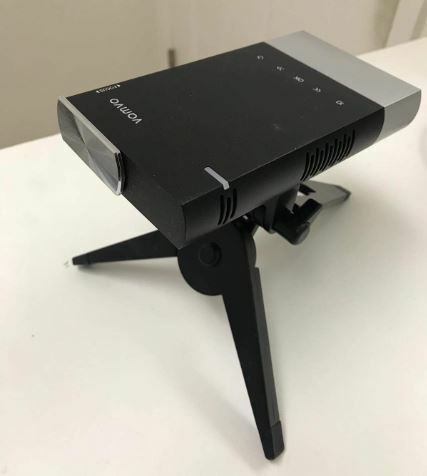 It may be worth noting the Vamvo S1 Ultra Mini Portable Projector is capable of accommodating 1080p content, and digitally up-scaling content into the 1080p format. But like running a 1080p video on a 480p television, that doesn’t you’re going to end up with a 1080p display. If you’re looking for the sweet spot for viewing, the Vamvo S1 Ultra Mini Portable Projector arguably looks its best with the screen-size set around 80”, and when projected from around 5ft. The 0.3” DLP display allows for the projector’s distance to be between 1.6 feet and 10 feet, but you’ll find the display quality falters as you exceed or extend these variables. The Vamvo S1 Ultra Mini Portable Projector makes use of DLP technology, which is what helps it achieve such miraculous image clarity and uniformity. The image quality might even catch you off guard at first. It’s the result of a fairly powerful contrast, especially relative to the compact size of the projector. The 1800 lumen LED lamp might surprise you as well. It’s not hard to find so-called portable projectors which are five-times the size of the S1 Ultra, but have nearly half its brightness. Even compared to projectors that are not portable, an 1,800 lumen presentation is fairly close to the middle of the pack. Putting that into more practical terms, 1,800 lumen display is enough to be played inside rooms that have subpar lighting conditions. Darker rooms provide far greater performance, and you need to keep the screen size within its lower limits if you expect to use the S1 inside a room that’s being struck by natural lighting. But within those common sense restraints, the S1 Ultra can nearly provide a business quality presentation. The nicest thing you can say about the built-in speaker is they make use of good sound technologies. But this projector is about the size of a smartphone, and so it sounds about the same as a smartphone. The speaker is 1.5 watts, which even gives it power comparable to a smartphone. Overcoming this kind of problem is easy with addition of some portable audio equipment. 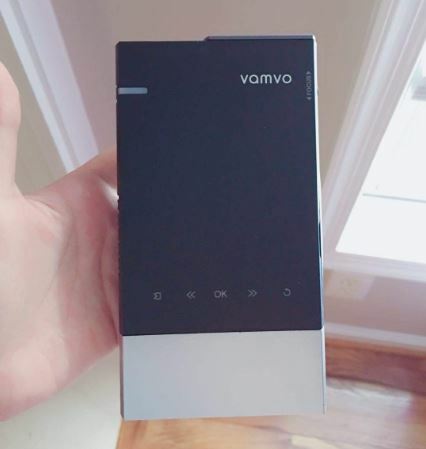 A simple 10-watt speaker would be a great companion, and could rather easily connect with the Vamvo S1 Ultra Mini Portable Projector. But if that’s not an option, the 1.5W speaker setup is passable for a small presentation among two or three people. One of the advantages of LED bulbs is they’re long lasting. The LED used inside this projector should last about 20,000 hours before you need to think about replacing it. You’ll may notice the bulb slightly dimming around the 15,000-hour mark, but you won’t have to worry about that. The longevity of the bulb is the wrong thing to focus on. Because the battery should last through about three years of heavy use, which works out to about 10,000 hours of playtime. The battery will be insufficient long before the bulb gives you any trouble. In any case, an approximate 10,000-hour lifespan isn’t bad at all. 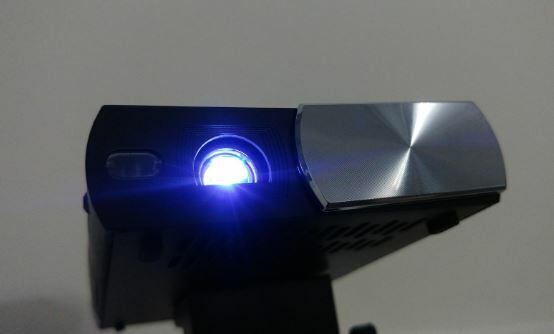 The Vamvo S1 Ultra Mini Portable Projector has a handful of operating system limitations. It supports iOS 9 and beyond, as well as Android 5.0 and beyond. That means basically any device made or updated in the past four years should be supported. The S1 includes a miniature tripod. Almost anytime you’re using a portable projector, it’s usually a good idea to throw it onto a tripod. Projectors are vulnerable to vibration, and small projectors are particularly vulnerable. You don’t want to notice the screen shaking every time someone stands up. 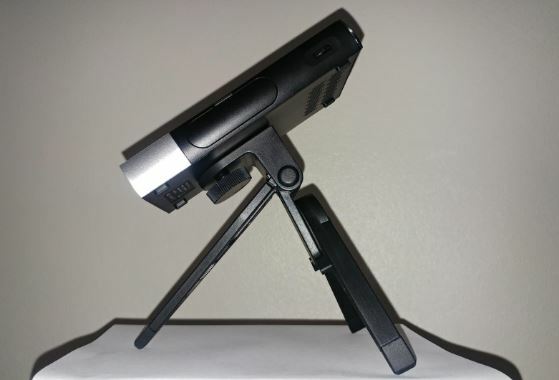 Though the included tripod is somewhat simple, it provides everything you need to both protect the projector and ensure the image goes undisturbed. The Vamvo S1 Ultra Mini Portable Projector also includes a power cable, remote control, and user manual. It does not include the AAA alkaline batteries necessary for the remote, but Vamvo does include a 3-month satisfaction guarantee, and an 18-month warranty. Who Should Choose the Vamvo S1 Ultra Mini Portable Projector? This projector delivers on a number of different fronts. Its portability is obvious. The small design hasn’t gotten in the way of the device being intuitive. Its full range of connection options provides the ability to access virtually any form of media, offline or online. With minimal additions, you can make the S1 a multimedia streaming machine that’s nearly as powerful as equipment ten-times larger. Touch button controls allow you to setup the projector without much work. Even mounting and adjusting the projector is simple. The mini-tripod that’s included isn’t amazing, but it does manage to secure the S1 in place and allow it to work uninterrupted. 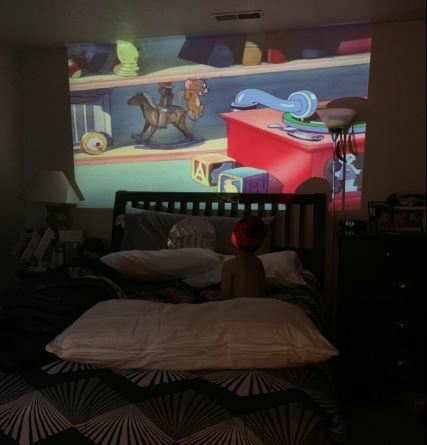 If you’re willing or able to use a less-portable projector, then you’ll find plenty of benefits for doing so. 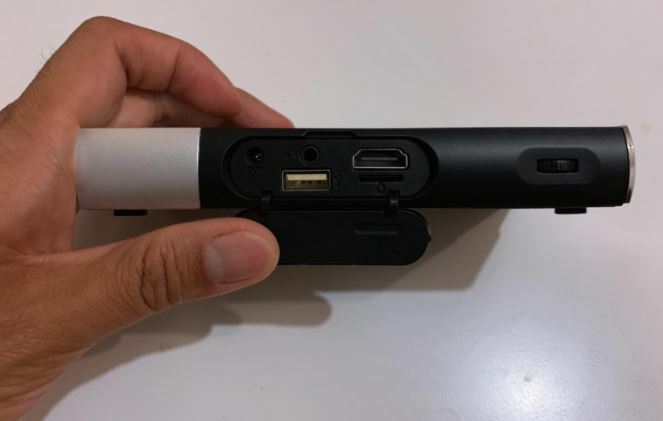 But if portability matters, then you’ll struggle to find small projectors that compare favorably to the Vamvo S1 Ultra Mini Portable Projector. It’s a great pick for someone who values portability above all else.